What if one of the biggest debates in federal politics today – the increasingly hysterical and partisan debate on a carbon price – actually mattered very little in terms of the practical outcomes purportedly being sought: the de-carbonisation of the Australian economy? First some basic assumptions so that this doesn’t get into a debate between “believers” and “sceptics”. We are talking here to those, like us, who believe that climate change is real, human-driven, and poses a serious threat to ecology and society. We proceed on the basis that the consensus scientific opinions on the nature and scale of the threat are roughly right, and that rich countries with high carbon emissions like Australia need to slash emissions by over 90 per cent by 2050 if they are to play a just part in averting a global problem. Yet it is precisely the immediacy and magnitude of the threat that leads us to reject the argument put by Wayne Swan in his speech to the National Press Club this week, that the “only way to drive investment in [clean-energy] technology is to put a price on pollution. Only a market mechanism does the job”. Instead, we believe that seeing a “price on carbon” as central to a low-emissions future, whether in the form of a carbon tax or trading scheme, is both inadequate to the task at hand and a dangerous distraction from effective climate action. Furthermore, while many people who want serious climate action have understandably thrown their weight behind the current carbon tax proposal being formulated in Canberra because at least “something” is being done, we believe this represents a political dead end for the climate movement which will constrain the possibilities for demanding more serious action in the future. A major problem with indirect market-based mechanisms is that they start by assuming that textbook accounts of how markets work match the operation of economic actors in actual markets. These are the same textbook stories and complicated economic modelling that assured us the GFC could never happen, based on an array of neo-classical economic dogmas that have repeatedly failed to predict market behaviour. Even progressive advocates of market approaches to climate action have to rest their claims on idealised theoretical models (such as when Greens MPs talk of “a properly-designed ETS”) because there simply is no successful evidence base to draw on. For example, it is claimed that a price on pollution will both drive reductions in pollution and promote innovation in clean alternatives. Yet differing strategies used by the US and Germany to reduce SO2 emissions (which cause acid rain) produced a different result. The German government simply told companies to cut their emissions, achieving a 90 per cent cut between 1982 and 1998. The US introduced a cap and trade market in 1990 but by the end of last decade emissions had only dropped by around 40 per cent. Most of the US cuts were delivered through the closure of a small number of smokestacks, and thanks to ready availability of cheap smokestack scrubbers and low-sulphur coal, with little innovation in industrial processes. By contrast, tough regulations in Germany forced businesses to innovate new techniques to reduce emissions (on innovation see here, p. 108-9 of chapter 3). In the absence of ready and cheap new outlets for investment, price signals do not necessarily cause a move away from existing production, what is known as “price inelasticity”. Australia has had very high taxes on petrol since the 1970s, but this has not led to a significant shift to public transport or clean energy vehicles. The lack of transport alternatives and government support for road-building and private-car culture mean that increased costs for consumers merely result in less spending on other things. This underlines the biggest problem for carbon pricing: the sheer scale of the fossil fuel economy means that even the partial success of the American SO2 scheme cannot be translated to carbon emissions. We are not just talking about the fact there are six gases involved, and in very big quantities. Carbon-based energy is at the very heart of the global economy and many other goods and services are heavily dependent on highly inefficient energy use (e.g. private vehicle use, aluminium production). The staggering size of the problem and the lack of ready-made and/or inexpensive alternatives mean that any serious transition will be costly and shake up the existing organisation of production. It is not that a rapid shift to renewables is technically impossible – Beyond Zero Emissions has shown conclusively that “we have the technology”. Yet price signals don’t aim to directly shift the economy to what’s needed to slash emissions. Rather, they act at the opposite end of the pipe, trying to promote changes in consumption so that eventually production will shift in response. In the absence of mass investment in things like renewables and mass public transit systems, as well as strict regulations on inefficient energy use and polluters, the end result is most likely to be a shift of the costs of the carbon price onto consumers as they struggle to pay for more expensive energy. The size of the carbon problem also reflects the scale of existing business investment in high-carbon areas. Pricing pollution is supposed to allow rapid and “cost-efficient” movements of investment into currently more expensive clean alternatives by making carbon energy less attractive. But it is more than current and future costs that must be accounted for. Most capitalist investment cannot be abandoned without a massive incursion into profits – even in a globalised world productive investments are sunk in specific geographic locations with expected returns depending on long-term use of paid-for machinery and infrastructure, not to mention complex supply and distribution networks shaped by established relationships with local authorities. Because of the size of the task of decarbonising the economy, price signals are a manifestly inadequate response. The politicians of the major parties concede as much when they set minimal reduction targets and talk of derisory carbon prices while planning compensation for big business polluters, promoting the coal-mining industry and doing nothing to stop new coal-fired power plants. We should judge them by their actions, not their fanciful claims about the power of markets. Already the threat of rising prices has been used by the political Right to undermine public sympathy for climate action. 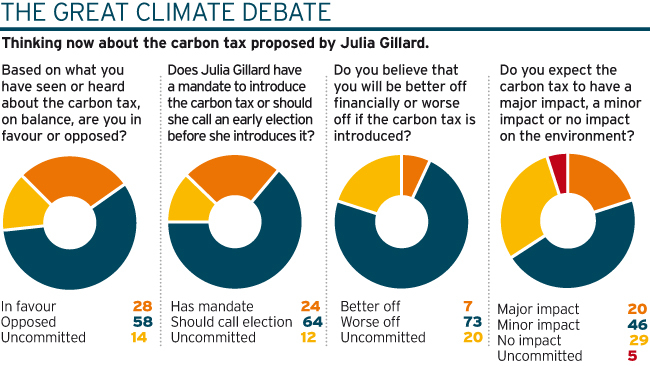 And last weekend’s Galaxy poll (graphic here) shows that 58 per cent of people oppose the carbon tax currently being debated, with only 28 per cent in support. Significantly, 73 per cent think it will leave them worse off and 75 per cent think it will have only minor or no impact on the environment. This is not to give any ground to Tony Abbott’s “direct action” approach, which is mainly about showering big polluters with incentives to change their ways, using ordinary taxpayers’ money that would otherwise have been spent elsewhere (see p. 10 of this pdf for a useful summary). That only two years ago Abbott was contemplating a carbon tax underlines the hypocritical nature of the national debate. Yet the Government, by trying to sell a complicated and inherently regressive market mechanism with no evidence of effectiveness, tied to an even more labyrinthine set of guarantees about compensation, is doing more to hurt the case for climate action than all the denialists and direct actionists put together. Why should ordinary people trust this government to do the right thing, especially when it locates this reform as the centrepiece of a revived neoliberal economic agenda? A faithful servant of the business elites, Gillard must have a screw loose if she thinks she can survive ramming through these kinds of measures in the face of widespread community cynicism, no matter how many rallies and TV ads GetUp! sees fit to organise. Moreover, she has a profound inability to register how patronising her claim is that “people” just don’t yet understand the technicalities of what is being proposed. One of the defining characteristics of this debate is the way that the approaches on offer are sold as transhistorical, as if things have never been done any other way. So it is with the obsession with market mechanisms, a feature of neoliberal ideology that has only really been dominant since the 1980s. Even people on the Left manage to convince themselves that carbon pricing is something other than a paradigmatic neoliberal approach to the way really-existing markets are destroying the environment. Neoliberal reforms, starting in the Hawke-Keating years, have also resulted in real wage cuts, a massive shift of national income from wages to profits, and an increase in economic inequality. Yet now we are expected to believe they will be used for good and simultaneously deliver social justice. Once again ordinary people are being told they must sacrifice while markets are used to guarantee profitability for business. If you look at World War 2, at the height of the war, Australia was spending $3 in $10, 30 per cent of its economy on a threat; in the United States in 1943, it was 42 per cent of the economy. The economies boomed, real wages rose, profits were good. Shellenberger and Nordhaus also argue that direct public investment (combined with regulation) can break the “Gordian Knot”, by producing rapid emission reductions and driving innovation to reduce the cost of clean alternatives. And the UK Campaign Against Climate Change has driven One Million Climate Jobs Now! (pdf, with additional technical data here), which argues for direct, job-creating government investment in the zero-carbon transition even before regulating and shutting down polluting industry. It thereby seeks to mobilise unused human capacity by employing people to make changes to the economy to rapidly achieve needed outcomes. In such cases it makes much more sense for governments to raise progressive taxes and/or take out loans to underwrite such large-scale investment, again a break from neoliberal orthodoxy. Restoring corporate and high-income personal tax rates to 1983 levels would raise much more money for decarbonisation (and other social goods) than any of the current price models being discussed. All of these approaches would, however, seriously challenge powerful economic actors who have more to gain by preserving some version of business as usual. Indeed, to respond to the scale of the global warming threat quickly and effectively makes such a challenge inevitable. The question being: is there political will to do it? One has to wonder if the political will is even weaker than first thought, when you read that of projected global carbon reductions it is estimated the developing world will be delivering 60 per cent of the target. Finally, there are three related objections to our position we want to anticipate: (1) That no matter how inadequate a carbon tax is, at least it establishes the principle of climate action, (2) that of course a price signal will have to be in conjunction with other mechanisms like direct regulation and public investment, and (3) that small, politically-realistic changes now can be added to later in an incremental fashion. In many ways this has become the formal line of the federal Greens MPs when challenged on their support for a tax. Yet this is an unreal view of what is actually happening. Firstly, if an ineffective and regressive measure is used to establish a principle, it is likely to undermine support for further extension of that principle. Secondly, mainstream political support for “complementary measures” has been almost completely abandoned. Last month’s budget did nothing to directly encourage renewables, instead anticipating a carbon tax’s magical properties. By backing the centrality of a price mechanism in Labor’s climate change committee, the Greens have legitimised Gillard’s neoliberal approach and undermined their own non-market policies. Thirdly, the acceptance of incrementalism ignores the fact that global warming is not amenable to such approaches. The longer you leave making deep cuts, the harder it is to avoid catastrophic disruptions, and the more socially disruptive serious action will be. Pricing pollution, then, is not just an environmentally and politically inadequate approach to “the greatest moral challenge of our generation”. It is a positive distraction from the task at hand, likely to create greater cynicism and opposition to serious climate action within the community. When we look back years from now on this national carbon tax debate, there can be little doubt it will be seen as yet another round of prevarication and mendacity that delayed necessary change while we edged ever closer to ecological catastrophe. Tad Tietze is a public hospital psychiatrist who works in Sydney and tweets as @Dr_Tad. Elizabeth Humphrys is a complaint investigator for a public agency and tweets as @liz_beths. They co-run the blog Left Flank.